We had the opportunity today to watch printing of the first sheets of the 2015 Ohio Bicycle Events Calendar. The 24-page “book” is actually kind of a big deal. 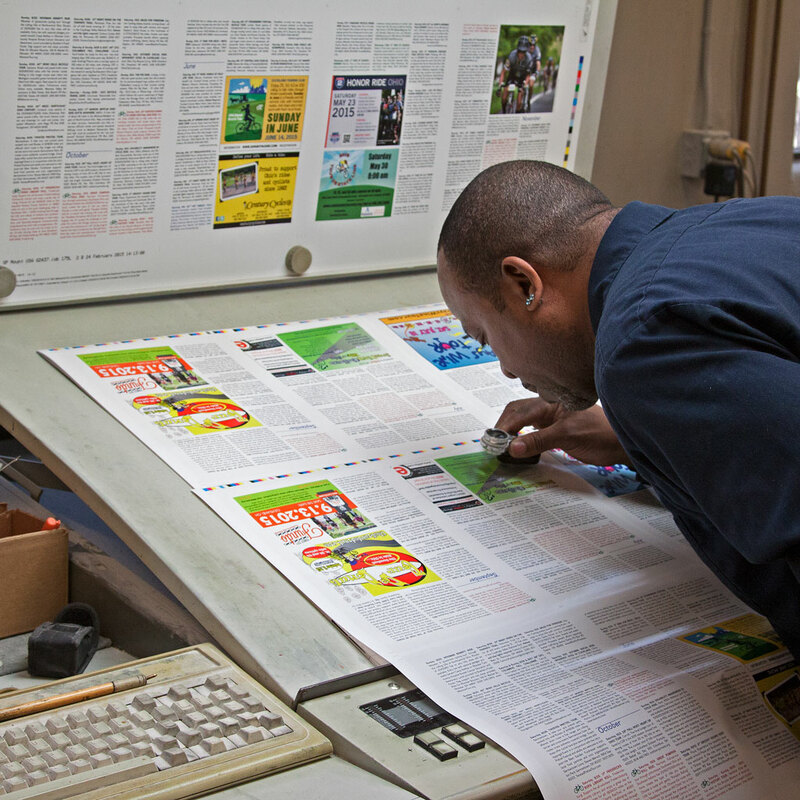 Annually we print 20,000 copies (or more) of the glossy piece to be distributed across Ohio and into portions of neighboring states. We try and make the Calendar as visually appealing as we can while maintaining its utilitarian nature — it’s a balance between getting people to notice and take home a copy and its usefulness in finding recreational opportunities. 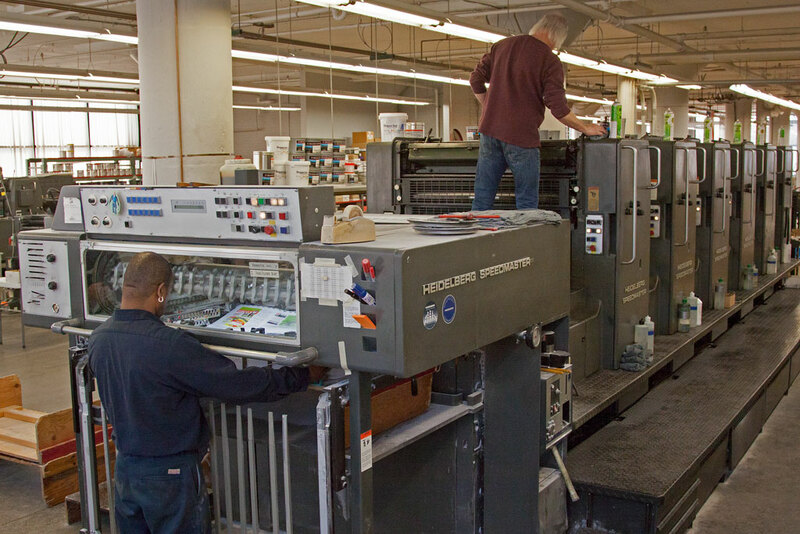 The job is demanding enough that it is run on large, sheet-fed, multi-color presses. This year and last, SP Mount in Cleveland, is the printer and fulfillment company. As we watched, the first test sheets came off the huge machine. Alvin, SP Mount pressman, grabbed the colorful pages and posted them at his inspection table. With a magnifier he examined registration marks and images for precise alignment; multi-color presses print one color at a time, one impression over the next, and, if the images don’t align perfectly, color fringes or borders will appear around them and pictures appear blurred. When things were right and the inks at the right viscosity, Alvin revved up the press to its optimal speed for the job. 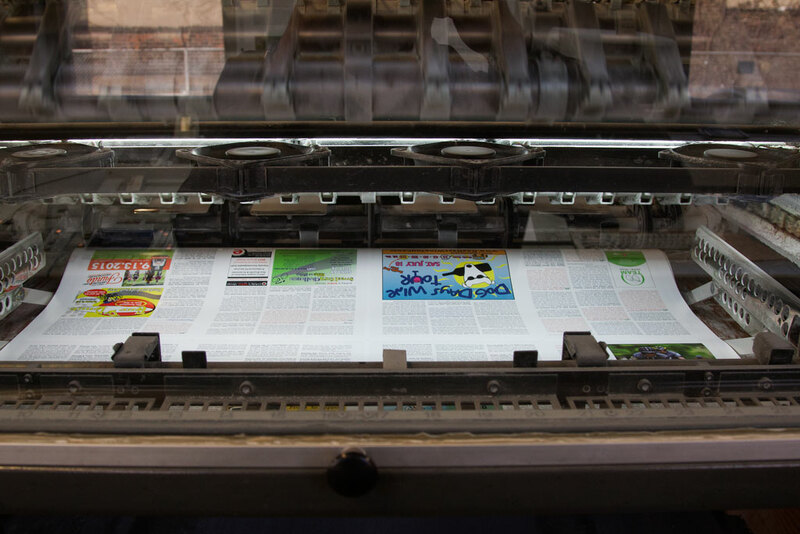 Although it could run much faster than set, every job has its best speed for reliable paper feed and quality — you don’t want a “paper jam” on a press as complex as Mount is using! Each set of pages takes hours of press time. So, the sheets with multiple pages will be printed on one side, then the other. Other sheets with more pages will be “worked and turned.” The job will sit to allow inks to “dry,” and then it’s off to the bindery where all of those sheets will be folded, assembled and trimmed to form finished books. After that, the Calendars will be packed into cartons for storage and shipping; some will be shipped immediately to bicycle shops. Shipping is expected to begin a week from today. It was exciting to see the 2015 Calendar becoming a reality and we hope it will please everyone involved. The Calendar is a big project bringing cyclists together with events and vendors they will love; now you have seen a little of what goes into its creation.